In classical Greek architecture, a stylobate (Greek: στυλοβάτης) is the top step of the crepidoma, the stepped platform upon which colonnades of temple columns are placed (it is the floor of the temple). The platform was built on a leveling course that flattened out the ground immediately beneath the temple. Some methodologies use the word stylobate to describe only the topmost step of the temple's base, while stereobate is used to describe the remaining steps of the platform beneath the stylobate and just above the leveling course. Others use the term to refer to the entire platform. The stylobate was often designed to relate closely to the dimensions of other elements of the temple. 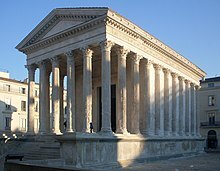 In Greek Doric temples, the length and width of the stylobate were related, and in some early Doric temples the column height was one third the width of the stylobate. The Romans, following Etruscan architectural tradition, took a different approach in using a much higher stylobate that typically had steps only in the front, leading to the portico. Curl, James Stevens. "Stylobate." A Dictionary of Architecture and Landscape Architecture. Oxford University Press, 2006. Lord, John. The Old Roman World. Kessinger Publishing, 2004. Conway, Hazel and Roenisch, Rowan. Understanding Architecture. Routledge, 2006. This page is based on the Wikipedia article Stylobate; it is used under the Creative Commons Attribution-ShareAlike 3.0 Unported License (CC-BY-SA). You may redistribute it, verbatim or modified, providing that you comply with the terms of the CC-BY-SA.